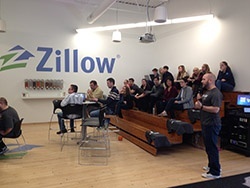 Last week, Mortech joined the rest of Zillow Group in participating in Innovation Week: a week-long event in which employees are encouraged to propose, execute, and present a project that can be implemented and used by the company now and/or in the future. Projects range from creating or improving new or existing software or processes, to improving an aspect of office culture. Several different teams from all of Zillow Group’s offices worked together to bring their projects to fruition, and many people worked late nights and through the weekend as well. Finally, on Monday of this week, the team’s presented their projects, including what they’d completed, other improvements and progress they wanted to make, and how soon they could expect their project to be rolled out by the company. Overall, Innovation Week was a huge success, celebrating and encouraging collaboration and innovation, and helped bolster a company-wide environment that is always pushing employees to move fast, think big, and always keep creating and improving.